There are literally thousands of different table bases for glass tops to choose from in a variety of shapes, sizes and materials. From wood and wrought iron to stone or a fabricated composite, you will be able to find one that fits both your style and your budget. Here are a few tips for choosing the right table base to fit your space. Decide if you want traditional, simple and clean, or Old World; this will help you narrow your choice of materials. After considering each of these suggestions, then it is time to shop! Metal Works crafts some of the most beautiful table bases on the market. They offer everything from a classic cabriole leg coffee table to an intricate dining table with hand-forged leaves. Custom sizes are available and finishes include natural iron black, natural iron pewter, painted faux verde, faux rust and faux bronze. The lead time for a piece is six to eight weeks and they require a 50 percent deposit on all orders. 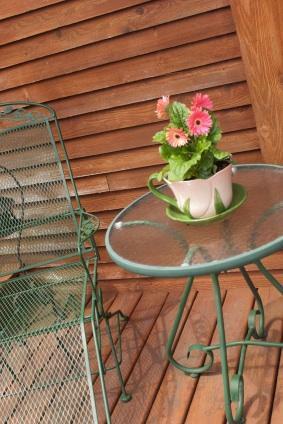 Check out CarolinaRustica.com for a wide range of wrought iron table bases that can be topped with glass, marble or wood. For a more contemporary look, browse through the selection of Charleston Forge tables, which offer a very simple, pared-down look for an excellent price. Johnston Casuals also offers a modern look finished in bright or brushed silver. The aptly named StoneTableBases.com provides a number of different stone table bases, that harken back to the the truly classical and neoclassical look of ancient Greece and Rome. These pieces are perfect for a backyard or [[Free Picnic Table Plans|patio] because they weather very well. The bases are crafted from crushed stone material that is reinforced with fiberglass. The Lone Star Trading Company in Frisco, Texas, offers some very cool wrought iron table bases that require owners with big and bold design personalities. There are dozens of different sizes and shapes to choose from--everything from a classic rectangular dining table to a tall, delicate bistro table. There is a table base out there for every design personality, and a glass top is the perfect way to show one off.